14 days before the arrival no charge. Fully equipped with mini-fridge, safe box, a/c and TV. Stay in one of the most piqturesque little streets of the island and be part of the famous cosmopolitan atmosphere of Mykonos. The vibrant Mykonos Town, steps away from Orpheas Room, is a longtime spirited gathering spot for progressive, socially minded types; coffeehouses, bars, restaurants and upscale retail shops abound. It's the place to head for a vegan dessert, a gay bar or to buy fresh products on Sundays at the farmers' market. 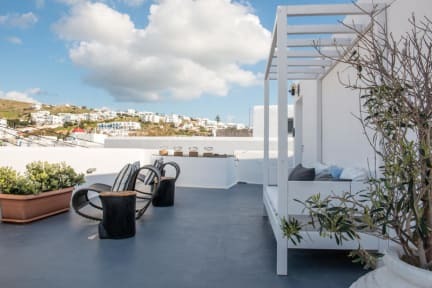 Centrally located with numerous options for nightlife (and frequent crowds), Orpheas Rooms is ideal for travelers who want to experience the vivid days and nights of Mykonos Town. Reception operates on a daily basis from 9 am 'till 9 pm. We do not offer transfer services. 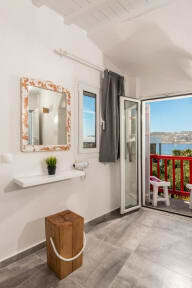 If you prefer a hip accommodation option in the heart of Mykonos Town, be sure to check out Orpheas Rooms.